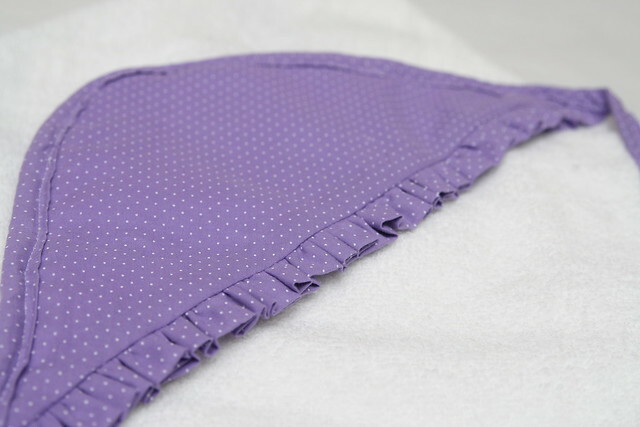 STITCHED by Crystal: Infant Hooded Towel - Girly Style! 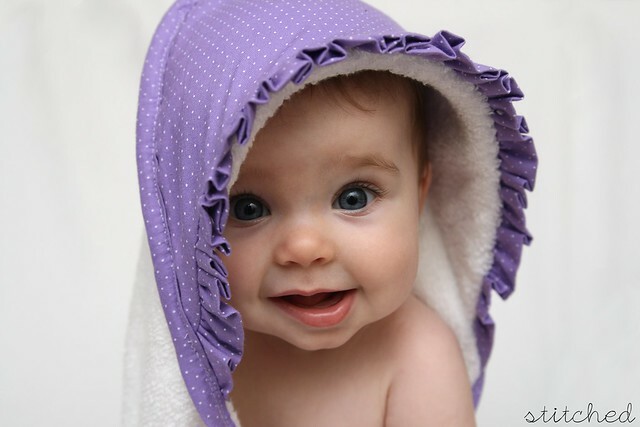 Infant Hooded Towel - Girly Style! Remember the hooded towel I made last year? It is probably what brought some of you to my blog. That was the very first thing I made when I started my blog and it is also still one of the most popular posts. 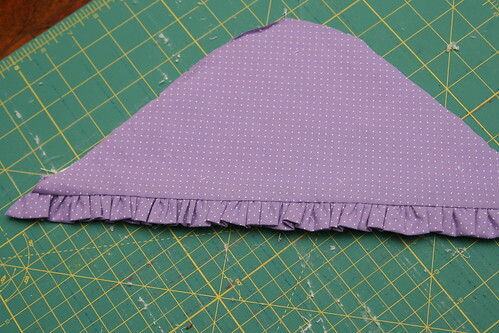 I made a new hooded towel, this time a girly one, with ruffles. 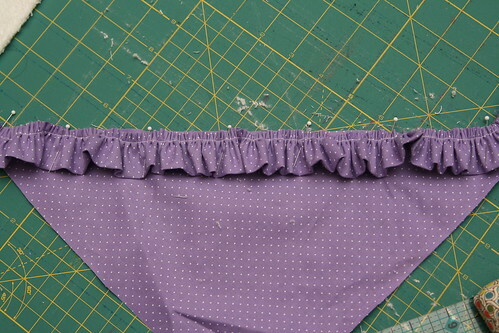 After 2 years of everything boy, it is exciting to have purple and ruffles, even on bath towels! I love these towels. They are so much better then the hooded towels you can buy at the store and quick to make. Plus, if you get a towel on sale they are cheaper than those store bought ones too. 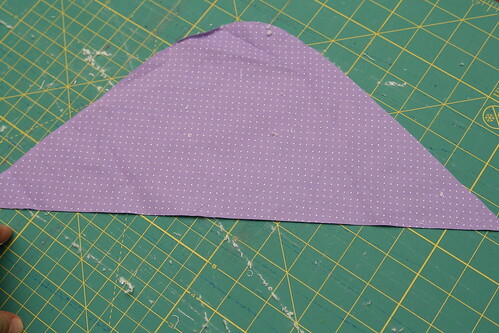 I cut a triangle of my trim fabric the same size as my hood triangle. I also cut a 2" x 40" strip, folded it in half and made a ruffle. 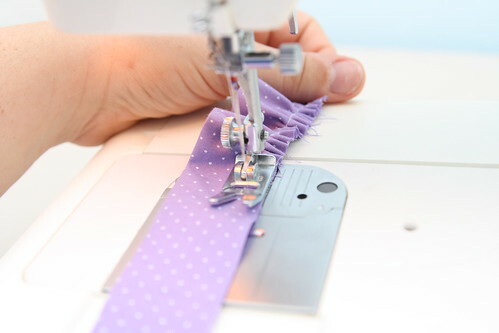 A super quick way to make a ruffle is to set your sewing machine stitch length on the longest setting and the tension on the highest setting. 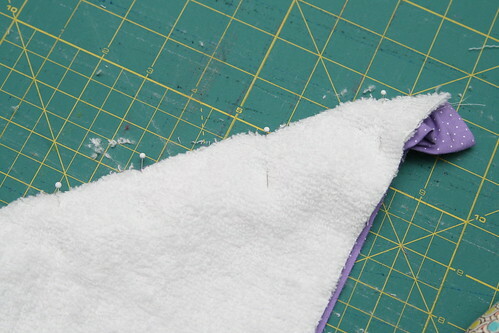 Then just sew like normal and watch your fabric come out all ruffled. I basted my ruffle to my hood. Sandwiched it with my towel hood piece. Then sewed it in place, flipped it right side out and ironed it. Then I added the hood to the towel just like before. Another thing I did differently this time was I used double fold bias tape for the edge instead of the double fold trim I used last time. Both work pretty much the same. Cute, right? This would make such a great shower gift for a mommy expecting a baby girl! Oh this is so perfect. Thanks. Your hooded towel is so cute with those ruffles! Thank you for the tutorial! I love this., It is so cute and simple to make. Can you help me to understand the difference in how you did the bias tape differently on this one from the last one? By the way, your towels are ADORABLE!